Positive change so often brings with it some kid of sacrifice but please, get behind Earth Hour this Saturday night, wherever you are in the world! We do it every year, and we stumble around in the dark, cursing it every time (and cursing the neighbors who still have their lights blazing). It feels good though and sends our kids a great message to grow up with. And in case you were wondering? Yes. You CAN make a difference. PS Get the kids to play this fun Earth Hour game using the arrow keys on your computer keyboard! In 2008, the plan was to take Earth Hour to the rest of Australia. But then the City of Toronto, Canada, signed up and it wasn’t long before 35 countries and almost 400 cities and towns were part of the event. It said something compelling to the world: that the climate challenges facing our planet are so significant that change needs to be global. In 2011, Earth Hour saw hundreds of millions of people across 135 countries switch off for an hour. But it also marked the start of something new – going Beyond the Hour to commit to lasting action on climate change. And with the power of social networks behind the Earth Hour message, we hope to attract even more participation so we can build a truly global community committed to creating a more sustainable planet." 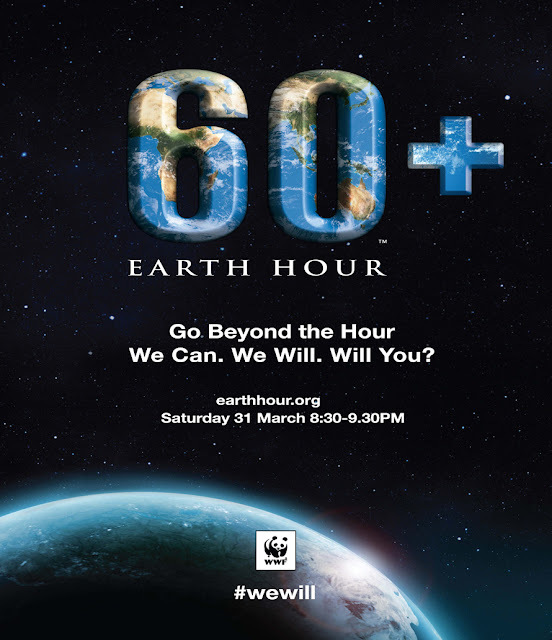 Turn off all your lights this Saturday, 31st March from 8.30pm - 9.30pm. Dear Louise - Thank you so much for reminding me about Earth Hour this weekend. I know it seems impossible to forget but your post here was such a good reminder. It will be candles all the way at our home.